Tipu is an approach to planning and executing service improvement. Find out more at http://www.basicsm.com/tipu. Tipu has its own Framework to allow us to organise our thinking and have something to compare other frameworks to. All the ITSM philosophers who follow this blog will be interested in it: the Framework attempts to be more complete than ITIL or COBIT. It is also intended to be a generalised Service Management framework not an ITSM one. There is no IT-specific content, in line with my new book Basic Service Management. Your feedback is of course welcomed. See what you can do with it - it is Creative Commons licensed. A best practices framework is a description of the idealised model for how to perform service management - also known as a body of knowledge (BoK). It gives us a structure to organise ourselves around, and a reference against which to benchmark ourselves. A framework is not a blueprint. We don’t need to aspire to do everything in the framework. We take advice and content from a framework as an input to determining how we will do things ourselves. It is guidance not law. You may find this framework useful but we do not recommend that you adopt it as your organisation’s reference framework (though you may if you wish, it is in the public domain). Your industry possibly already has a best practice framework, and you may well have already adopted something. Go with whatever works for your organisation and/or has broad support in your industry [for ITSM that would of course be ITIL and/or COBIT]. The Tipu Framework represents just about all of the essential components (practices and functions) of service management best practice. None of these are optional. If any one of these is not being performed, or not to an adequate level of capability, then there is a risk to delivery of services. The Tipu Framework is a synthesis of concepts from IT (COBIT, ITIL) and other sources, along with a number of original concepts, to provide a broader framework that addresses the gaps of each of the sources. The sources were IT-specific, but the framework is intended to be industry-agnostic – i.e. relevant to service management anywhere. The framework is used to structure the Tipu units of improvement work (“Mahi”), and to test other best practice bodies of knowledge against, to see how complete they are. The downloadable document has descriptions of each of the fifty components and their origins. 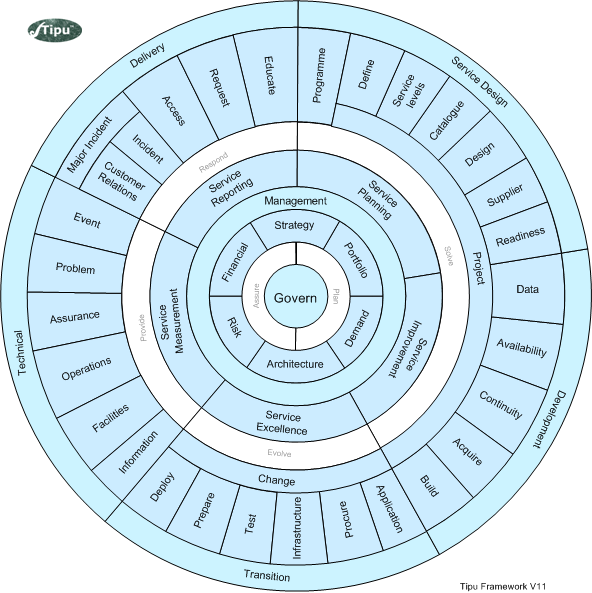 The Tipu Framework by Two Hills Ltd is licensed under a Creative Commons Attribution-ShareAlike 3.0 Unported License. Content must be attributed to "Two Hills Ltd www.twohills.co.nz". The Two Hills logo, “Tipu” and the Tipu logo are trademarks of Two Hills Ltd.